Not to be confused with Phi Kappa Sigma. For other uses, see Skull and crossbones (disambiguation). Skull and Bones is an undergraduate senior secret student society at Yale University in New Haven, Connecticut. The oldest senior class society at the university, Skull and Bones has become a cultural institution known for its powerful alumni and various conspiracy theories. The society's alumni organization, the Russell Trust Association, owns the organization's real estate and oversees the membership. The society is known informally as "Bones", and members are known as "Bonesmen". Skull and Bones was founded in 1832 after a dispute among Yale debating societies Linonia, Brothers in Unity, and the Calliopean Society over that season's Phi Beta Kappa awards. William Huntington Russell and Alphonso Taft co-founded "the Order of the Skull and Bones". The first senior members included Russell, Taft, and 12 other members. The society's assets are managed by its alumni organization, the Russell Trust Association, incorporated in 1856 and named after the Bones' co-founder. The association was founded by Russell and Daniel Coit Gilman, a Skull and Bones member. The first extended description of Skull and Bones, published in 1871 by Lyman Bagg in his book Four Years at Yale, noted that "the mystery now attending its existence forms the one great enigma which college gossip never tires of discussing". Brooks Mather Kelley attributed the interest in Yale senior societies to the fact that underclassmen members of then freshman, sophomore, and junior class societies returned to campus the following years and could share information about society rituals, while graduating seniors were, with their knowledge of such, at least a step removed from campus life. Skull and Bones selects new members among students every spring as part of Yale University's "Tap Day", and has done so since 1879. Since the society's inclusion of women in the early 1990s, Skull and Bones selects fifteen men and women of the junior class to join the society. Skull and Bones "taps" those that it views as campus leaders and other notable figures for its membership. The Skull and Bones Hall is otherwise known as the "Tomb". The building was built in three phases: the first wing was built in 1856, the second wing in 1903, and Davis-designed Neo-Gothic towers were added to the rear garden in 1912. The front and side facades are of Portland brownstone in an Egypto-Doric style. The 1912 tower additions created a small enclosed courtyard in the rear of the building, designed by Evarts Tracy and Edgerton Swartwout of Tracy and Swartwout, New York. Evarts Tracy was an 1890 Bonesman, and his paternal grandmother, Martha Sherman Evarts, and maternal grandmother, Mary Evarts, were the sisters of William Maxwell Evarts, an 1837 Bonesman. The architect was possibly Alexander Jackson Davis or Henry Austin. Architectural historian Patrick Pinnell includes an in-depth discussion of the dispute over the identity of the original architect in his 1999 Yale campus history. Pinnell speculates that the re-use of the Davis towers in 1911 suggests Davis's role in the original building and, conversely, Austin was responsible for the architecturally similar brownstone Egyptian Revival Grove Street Cemetery gates, built in 1845. Pinnell also discusses the Tomb's aesthetic place in relation to its neighbors, including the Yale University Art Gallery. In the late 1990s, New Hampshire landscape architects Saucier and Flynn designed the wrought iron fence that surrounds a portion of the complex. The forty-acre retreat is intended to give Bonesmen an opportunity to "get together and rekindle old friendships." A century ago the island sported tennis courts and its softball fields were surrounded by rhubarb plants and gooseberry bushes. Catboats waited on the lake. Stewards catered elegant meals. But although each new Skull and Bones member still visits Deer Island, the place leaves something to be desired. "Now it is just a bunch of burned-out stone buildings," a patriarch sighs. "It's basically ruins." Another Bonesman says that to call the island "rustic" would be to glorify it. "It's a dump, but it's beautiful." 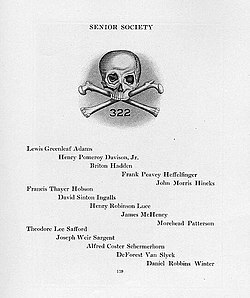 Yearbook listing of Skull and Bones membership for 1920. The 1920 delegation included co-founders of Time magazine, Briton Hadden and Henry Luce. Like other Yale senior societies, Skull and Bones membership was almost exclusively limited to white Protestant males for much of its history. While Yale itself had exclusionary policies directed at particular ethnic and religious groups, the senior societies were even more exclusionary. While some Catholics were able to join such groups, Jews were more often not. Some of these excluded groups eventually entered Skull and Bones by means of sports, through the society's practice of tapping standout athletes. Star football players tapped for Skull and Bones included the first Jewish player (Al Hessberg, class of 1938) and African-American player (Levi Jackson, class of 1950, who turned down the invitation for the Berzelius Society). Yale became coeducational in 1969, prompting some other secret societies such as St. Anthony Hall to transition to co-ed membership, yet Skull and Bones remained fully male until 1992. The Bones class of 1971's attempt to tap women for membership was opposed by Bones alumni, who dubbed them the "bad club" and quashed their attempt. "The issue", as it came to be called by Bonesmen, was debated for decades. The class of 1991 tapped seven female members for membership in the next year's class, causing conflict with the alumni association. The trust changed the locks on the Tomb and the Bonesmen instead met in the Manuscript Society building. A mail-in vote by members decided 368–320 to permit women in the society, but a group of alumni led by William F. Buckley obtained a temporary restraining order to block the move, arguing that a formal change in bylaws was needed. Other alumni, such as John Kerry and R. Inslee Clark, Jr., spoke out in favor of admitting women. The dispute was highlighted on an editorial page of The New York Times. A second alumni vote, in October 1991, agreed to accept the Class of 1992, and the lawsuit was dropped. Judith Ann Schiff, Chief Research Archivist at the Yale University Library, has written: "The names of its members weren't kept secret‍—‌that was an innovation of the 1970s‍—‌but its meetings and practices were." While resourceful researchers could assemble member data from these original sources, in 1985, an anonymous source leaked rosters to Antony C. Sutton. This membership information was kept privately for over 15 years, as Sutton feared that the photocopied pages could somehow identify the member who leaked it. He wrote a book on the group, America's Secret Establishment: An Introduction to the Order of Skull and Bones. The information was finally reformatted as an appendix in the book Fleshing out Skull and Bones, a compilation edited by Kris Millegan and published in 2003. Among prominent alumni are former president and Chief Justice William Howard Taft (a founder's son); former presidents and father and son George H. W. Bush and George W. Bush; Chauncey Depew, president of the New York Central Railroad System, and a United States Senator from New York; Supreme Court Justices Morrison R. Waite and Potter Stewart; James Jesus Angleton, "mother of the Central Intelligence Agency"; Henry Stimson, U.S. Secretary of War (1940–1945); Robert A. Lovett, U.S. Secretary of Defense (1951–1953); William B. Washburn, Governor of Massachusetts; and Henry Luce, founder and publisher of Time, Life, Fortune, and Sports Illustrated magazines. John Kerry, former U.S. Secretary of State and former U.S. Senator; Stephen A. Schwarzman, founder of Blackstone Group; Austan Goolsbee, Chairman of Barack Obama's Council of Economic Advisers; Harold Stanley, co-founder of Morgan Stanley; and Frederick W. Smith, founder of FedEx, are all reported to be members. In the 2004 U.S. Presidential election, both the Democratic and Republican nominees were alumni. George W. Bush wrote in his autobiography, "[In my] senior year I joined Skull and Bones, a secret society; so secret, I can't say anything more." When asked what it meant that he and Bush were both Bonesmen, former presidential candidate John Kerry said, "Not much, because it's a secret." The number "322" appears in Skull and Bones' insignia and is widely reported to be significant as the year of Greek orator Demosthenes' death. A letter between early society members in Yale's archives suggests that 322 is a reference to the year 322 BC and that members measure dates from this year instead of from the common era. In 322 BC, the Lamian War ended with the death of Demosthenes and Athenians were made to dissolve their government and establish a plutocratic system in its stead, whereby only those possessing 2,000 drachmas or more could remain citizens. Documents in the Tomb have purportedly been found dated to "Anno-Demostheni". Members measure time of day according to a clock 5 minutes out of sync with normal time, the latter is called "barbarian time". One legend is that the numbers in the society's emblem ("322") represent "founded in '32, 2nd corps", referring to a first Corps in an unknown German university. Members are assigned nicknames (e.g., "Long Devil", the tallest member, and "Boaz", a varsity football captain, or "Sherrife" prince of future). Many of the chosen names are drawn from literature (e.g., "Hamlet", "Uncle Remus") religion, and myth. The banker Lewis Lapham passed on his nickname, "Sancho Panza", to the political adviser Tex McCrary. Averell Harriman was "Thor", Henry Luce was "Baal", McGeorge Bundy was "Odin", and George H. W. Bush was "Magog". Skull and Bones has a reputation for stealing keepsakes from other Yale societies or from campus buildings; society members reportedly call the practice "crooking" and strive to outdo each other's "crooks". The society has been accused of possessing the stolen skulls of Martin Van Buren, Geronimo, and Pancho Villa. The group Skull and Bones is featured in conspiracy theories, which claim that the society plays a role in a global conspiracy for world control. Theorists such as Alexandra Robbins suggest that Skull and Bones is a branch of the Illuminati, having been founded by German university alumni following the order's suppression in their native land by Karl Theodor, Elector of Bavaria with the support of Frederick the Great of Prussia,[dubious – discuss] or that Skull and Bones itself controls the Central Intelligence Agency. Skull and Bones has been satirized from time to time in the Doonesbury comic strips by Garry Trudeau, Yale graduate and Scroll and Key member. There are overt references, especially in 1980 and December 1988, with reference to George H. W. Bush, and again when the society first admitted women. The Skulls (2000) and The Skulls II (2002) films are based on the conspiracy theories surrounding Skull and Bones. A third film, The Skulls III (2004), is based on the first woman to be "tapped" to join the society. In Baz Luhrmann's film version of F. Scott Fitzgerald's novel The Great Gatsby, Nick Carraway calls Tom Buchanan Boaz. Tom in turn calls Nick Shakespeare. Nick has said earlier that he met Tom at Yale. It is thereby implied that they were in Skull and Bones together. In the novel, Yale is not explicitly mentioned (rather, they were in New Haven together) and it is only stated that they were in the same senior society. In The Good Shepherd (2006) the protagonist becomes a member of Skull and Bones while studying at Yale. In The Simpsons season 28 episode "The Caper Chase", Mr. Burns visits the Skull and Bones society to meet with Bourbon Verlander about for-profit universities. In the episode “The Canine Mutiny” (season 8) after doing a secret handshake with a dog, Mr. Burns says: “I believe this dog was in Skull and Bones”. ^ Stevens, Albert C. (1907). Cyclopedia of Fraternities: A Compilation of Existing Authentic Information and the Results of Original Investigation as to the Origin, Derivation, Founders, Development, Aims, Emblems, Character, and Personnel of More Than Six Hundred Secret Societies in the United States. E. B. Treat and Company. p. 338. ISBN 978-1169348677. OCLC 2570157. ^ a b "Change In Skull And Bones. ; Famous Yale Society Doubles Size of Its House — Addition a Duplicate of Old Building" (PDF). The New York Times. September 13, 1903. Retrieved November 5, 2011. ^ Niarchos, Nicolas; Zapana, Victor (December 5, 2008). "Yale's secret social fabric". Yale Daily News. Retrieved 5 November 2017. ^ a b Richards, David (May 2015). "The Origins of the Tomb". Yale Alumni Magazine. Retrieved 5 November 2017. ^ Schiff, Judith Ann. "How the Secret Societies Got That Way". Yale Alumni Magazine (September/October 2004). Archived from the original on April 4, 2005. Retrieved November 5, 2011. ^ Bagg, Lyman Hotchkiss (1871). Four Years at Yale. New Haven, C.C. Chatfield & Co. ISBN 978-1425569372. OCLC 2007757. ^ Yale: A History, Brooks Mather Kelley, (New Haven, Connecticut: Yale University Press, Ltd.), 1974. ^ "Scull and Bones". Saucierflynn.com. Archived from the original on 2007-09-18. ^ Leung, Rebecca (June 13, 2004). "Skull And Bones: Secret Yale Society Includes America's Power Elite". CBS News. Retrieved 2011-03-09. ^ a b Oren, Dan A. (1985). Joining the Club: A History of Jews and Yale. New Haven: Yale University Press. pp. 87–88, 162. ISBN 0-300-03330-3. ^ a b Karabel, Jerome (2005). The Chosen: The Hidden History of Admission and Exclusion at Harvard, Yale, and Princeton. Boston: Houghton Mifflin. pp. 53–36. ^ a b c d e Andrew Cedotal, Rattling those dry bones, Yale Daily News, April 18, 2006. ^ "Yale Alumni Block Women in Secret Club". New York Times. September 6, 1991. Retrieved 2009-02-28. ^ Semple, Robert B., Jr. (April 18, 1991). "High Noon on High Street". New York Times. Retrieved 2009-02-28. ^ a b Hevesi, Dennis (October 26, 1991). "Shh! Yale's Skull and Bones Admits Women". New York Times. Retrieved 2009-02-28. ^ Barron, James (July 25, 1991). "Male Fortress Falls at Yale: Bonesmen to Admit Women". New York Times. Retrieved 2009-02-28. ^ Aaron Bray (October 12, 2007). "Goolsbee '91 puts economics degree to use for Obama". Yale Daily News. Archived from the original on October 3, 2012. ^ Bush, George W. (1999). A Charge to Keep. William Morrow and Co. ISBN 0-688-17441-8. ^ Oldenburg, Don (April 4, 2004). "Bush, Kerry Share Tippy-Top Secret". The Washington Post. Retrieved November 5, 2011. ^ a b Robbins, Alexandra (May 2000). "George W., Knight of Eulogia". The Atlantic Monthly. Retrieved 5 November 2017. ^ "Letter from a member of Skull and Bones Society to another member". Yale Manuscripts & Archives Digital Images Database. Yale University Library. 23 Mar 1860. Retrieved 5 November 2017. ^ Stevens, Albert C. (1907). Cyclopedia of Fraternities: A Compilation of Existing Authentic Information and the Results of Original Investigation as to the Origin, Derivation, Founders, Development, Aims, Emblems, Character, and Personnel of More Than Six Hundred Secret Societies in the United States. E. B. Treat and Company. p. 340. ISBN 978-1169348677. OCLC 2570157. ^ a b Robbins, Alexandra. 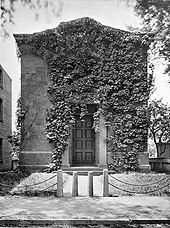 Secrets of the Tomb: Skull and Bones, the Ivy League, and the Hidden Paths of Power. Back Bay Books, 2003. ^ "German postcard included in a Skull and Bones photograph album originally owned by Chester Wolcott Lyman, BA 1882" [Photograph albums of the Skull and Bones Society]. Yale University Library Manuscripts and Archives. 1882. ^ Lassila;Branch (2006). "Whose skull and bones?" (PDF). Yale Alumni Magazine: 20–22. ^ Greenburg, Zach O. (January 23, 2004). "Bones may have Pancho Villa skull". The Yale Herald. Archived from the original on December 20, 2008. Retrieved November 5, 2011. ^ Citro, Joseph A. (2005). Weird New England (illustrated ed.). Sterling Publishing Company, Inc. pp. 270–71. ISBN 1-4027-3330-5. ^ Stephey, MJ (Feb 23, 2009). "A Brief History of the Skull & Bones Society". Time. ^ Dempsey, Rachel (January 18, 2007). "Real Elis inspired fictional 'shepherd'". Yale Daily News. Archived from the original on October 22, 2012. Retrieved 2012-04-05. ^ Soper, Kerry (2008). Garry Trudeau: Doonesbury and the Aesthetics of Satire. University Press of Mississippi. pp. 25, 42. ISBN 1-934110-89-2. ^ Ebert, Roger. (2013-07-10) The Skulls Movie Review & Film Summary (2000) | Roger Ebert. Rogerebert.suntimes.com. Retrieved on 2013-07-15. ^ "The Great Gatsby". Publicbookshelf.com. Archived from the original on 2014-04-07. Hodapp, Christopher; Alice Von Kannon (2008). Conspiracy Theories & Secret Societies For Dummies. Hoboken, NJ: Wiley. ISBN 0-470-18408-6. Klimczuk, Stephen & Warner, Gerald. Secret Places, Hidden Sanctuaries: Uncovering Mysterious Sites, Symbols, and Societies. Sterling Publishing, 2009, New York and London. ISBN 978-1-4027-6207-9. pp. 212–232 ("University Secret Societies and Dueling Corps"). Robbins, Alexandra. Secrets of the Tomb: Skull and Bones, the Ivy League, and the Hidden Paths of Power. Back Bay Books, 2003. ISBN 0-316-73561-2. Sutton, Antony C. America's Secret Establishment: An Introduction to the Order of Skull & Bones. Walterville, OR: Trine Day, 2003. ISBN 0-9720207-0-5. Wikimedia Commons has media related to Skull and Bones.